Legit health food or high-priced hoax? Anecdotal evidence supports some of those claims. But so far, we don’t have solid data supporting alkaline water’s use. Until we learn more, save your money: Stick to tap water and supplement with mineralized water if you like. Many people believe that the typical North American diet contributes to chronic low-grade acidosis – a condition that may be associated with poor health outcomes including heart problems, altered hormonal status, and the loss of muscle or bone. Proponents of alkaline water believe that it can neutralize the acid in your bloodstream and help your body metabolize nutrients more effectively, leading to better health and performance. Let’s take a closer look at these claims. Most of us know that water is a big deal. In fact, our bodies are largely made of the stuff. No other substance is so important to our physiology or health. No wonder so many of us feel concerned about increased pollutants and contaminants in our tap water. But before we completely dismiss North American tap water, the good news is that it’s actually quite safe compared to the water in many other parts of the world. Tap water contains different dissolved elements that influence its pH level. Pure water has a pH level close to 7. 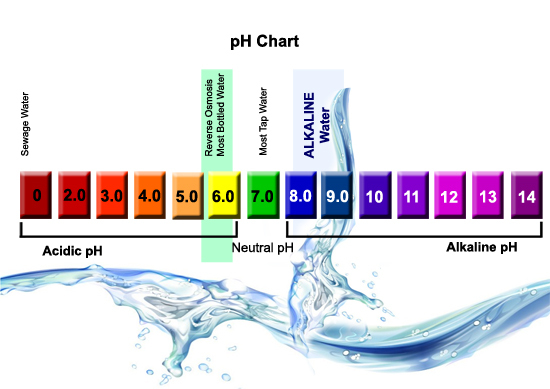 Alkaline water has a pH above 7. Our bodies do a fantastic job of maintaining blood pH within a tight range. This means that “chronic low-grade acidosis” won’t appear on lab reports. But what if those reports are deceptive? Proponents of alkaline water argue that even if your pH levels look fine, your body could be drawing on stored buffers from bone and muscle to maintain pH within the ideal range. And that would not be good. Is alkaline water really best? The human body is complex. Claiming that everyone needs to “alkalize” might be an over-simplification. For one thing, each organ system has a unique pH range. And since there are various ways that the body maintains pH balance, if pH is out of whack, it’s important to get to the underlying cause. Without knowing the cause, you can’t determine whether alkaline water will really help you. While anecdotal evidence suggests that the pH of water could be relevant to health, so far, there’s not a lot of firm data. But focusing on the pH level of our water might be somewhat beside the point. Because if alkaline water is helpful, that might be due to the minerals it contains rather than its pH level, per se. Data do indicate that consuming alkaline or “hard” water can increase overall body alkalinity. However, this may not always be a benefit. For example, if someone has a kidney condition, or is taking a medication that alters kidney function, some of the minerals in alkaline water could start to accumulate in the body. For these people, high alkalinity might lead to negative side effects. If kidney patients should avoid alkaline water, athletes and exercisers are one sub-group who might benefit from drinking it. Why? Because alkaline water may allow active people to retain more fluid in the cardiovascular system, while decreasing their urine output and blood osmolality. That’s important because high plasma osmolality is associated with elevated risk of death from stroke. The research suggests that these effects might not be instantaneous, but rather, gradual. Thus: Alkaline water might improve overall hydration status in active people over time. And proper hydration is important to our health. But again, this is a big “maybe”. Physical activity and diet can alter pH balance. A diet high in fresh vegetables will usually result in greater alkalinity. So alkaline water’s benefits might be more obvious in people who do not exercise, or those who eat a typical Western diet of processed foods. Meanwhile, folks who exercise regularly and eat a healthy diet of whole foods might fail to notice much change from drinking alkaline water. But even if they don’t particularly notice a change, active people might benefit from alkaline water for reasons that go beyond improved hydration. Intense exercise spurs our muscles to produce more hydrogen ions than our body can efficiently remove. Fatigue increases. Drinking alkaline water might enhance the body’s buffering capacity and temper the acidity, thus improving our performance. Note that mineral supplements (calcium, magnesium, potassium) decrease cardio-respiratory stress and blood lactate responses, while improving power output in endurance athletes. That’s why long-distance runners sometimes supplement with sodium bicarbonate. This practice would seem to support the benefits of mineralized water. Tap water is disinfected to protect us from bacteria and toxins. But when disinfectants interact with organic matter in our tap water, disinfectant by-products form. DBPs can lead to health and environmental problems – a good reason to avoid them. Alkaline water seems to break down some DBPs, neutralizing their dangers to us. Meanwhile, alkaline urine might help to draw certain environmental toxins and pharmaceuticals from the body, another potential benefit. Sounds great, right? But other DBPs seem to thrive in an alkaline environment. So all in all, alkaline water is not necessarily better at protecting us from toxins. Oxidation-reduction potential (ORP) is a measure of the tendency of a solution to either gain or lose electrons when it is subject to change by the introduction of a new species. ORP seems to influence bacteria in the gut. Electrochemically activated (i.e. ionized) water possesses a negative oxidation-reduction potential, which means it might offer extra disinfectant properties, helping to protect us from dangerous microorganisms. Ionized water seems to result in lowered glycation levels and reduced liver damage in rats with poor blood sugar control. Now, rats are not humans, and it is tricky to extrapolate directly from animal studies to human health. Even so, this evidence is worth weighing in the balance. Here’s a brief overview of the claims for alkaline water and the clinical research evidence that currently supports them. Alkaline water helps treat chronic acidosis Weak / speculative. The body regulates pH tightly, and different organs have slightly different pH requirements. There is little clinical evidence that “chronic low-grade acidosis” exists. Alkaline water improves overall health Weak / speculative. Alkaline water may increase overall body alkalinity, but it’s not clear that this improves health outcomes. People with certain health conditions should avoid excessive mineral intake. Alkaline water is important for athletes Weak / speculative. Proper hydration helps athletes, but there’s no evidence that alkaline water is anything special in this regard. Some benefits may be derived from buffering acidity. Alkaline water protects us from toxins Weak / equivocal. We may avoid toxins from disinfectant by-products in tap water, but other toxins can thrive in alkaline water. Alkaline water contains a negative oxidation-reduction potential, helping protect us from pathogens Weak / speculative. ORP seems to influence bacteria in the gut. Electrochemically activated (i.e. ionized) water possesses a negative oxidation-reduction potential, which means it might offer extra disinfectant properties, helping to protect us from dangerous microorganisms. Alkaline water reduces advanced glycation endproducts (AGEs) Suggestive / speculative. Ionized water seems to result in lowered glycation levels and reduced liver damage in rats with poor blood sugar control. How can you make sure you’re getting it if it doesn’t come through your tap? Hydration is the third largest global industry, trailing only oil and electricity. Americans spend almost $8 billion per year on bottled water! Is bottled water alkaline? That depends. Bottled mineral waters tend to be alkaline. Non-mineral bottled waters are unlikely to be alkaline. But adding mineral powders to regular tap water can make them alkaline. I followed up with some of the companies to double check the numbers presented in test results. Essentia guarantees 9.5 on the website (which is more alkaline). Dasani ranges between 5.0-7.0 (which is less alkaline or neutral). Aquafina ranges between 5.5-7.0 (which is less alkaline or neutral). Smartwater has a pH of about 7.0 (which is neutral). Evian has a pH of 7.2 (which is more alkaline). ph and ORP (Oxidation Reduction Potential) testing of bottled waters, 2009. Can you make alkaline water? If your local tap water is especially acidic, you might be wondering if it’s possible to fix that. You can buy a machine, called a water ionizer, which supposedly creates alkaline water via a process called ionization. Manufacturers claim that these machines allow water to interact with electrodes to split hydrogen ions from oxygen, influencing the pH of the water. However, most chemists say that “ionized water” is a meaningless term, and that health claims made for ionized water are unfounded. On the other hand, JB did a series of experiments with an ionizer and found the water’s pH consistently more alkaline. He also found that his urinary pH was consistently more alkaline when drinking the ionized water. Whether this makes a significant health difference — or not — remains to be seen. Right now, it’s not clear from the available evidence whether alkaline water does us any good. There’s no hard data either way. But for most people, drinking alkaline water won’t hurt. My personal solution? I’ll continue to filter my tap water, and add water with naturally occurring minerals on occasion. Krishnan K & Carrier R. Approaches for evaluation the relevance of multiroute exposures in establishing guideline values for drinking water contaminants. J Environmental Science and Health Part C 2008;26:300-316.Minich DM & Bland JS. Acid-alkaline balance: Role in chronic disease and detoxification. Alternative Therapies in Health and Medicine 2007;13:62-65.